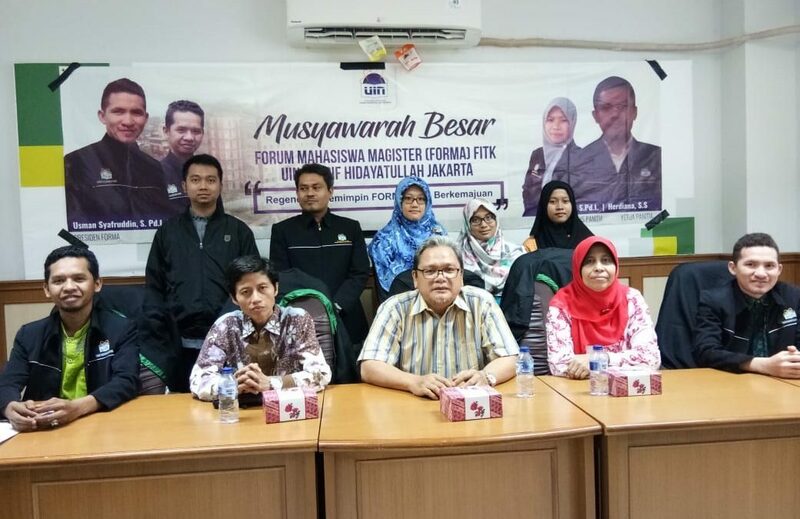 FITK, UIN News Online – Members of Master’s Student Forum (FORMA) FITK UIN Jakarta holds deliberative event (Mubes) themed “Regenerasi Pemimpin Forma yang Berkemajuan”, Wednesday (03/21/2019) at FITK building, campus I of UIN Jakarta. Present in the event, Deputy Dean for Student Affairs of FITK Fauzan and all FITK Master’s program Department Heads. Fauzan in his Fauzan thanked Usman and the Secretary General of Harisal for his dedication to Forma for the past year. Fauzan also said that there were still obstacles related to the Forma FITK budget that had not been allocated by the Rectorate. Even so, Fauzan promised to seek Faculty tactical funds to assist Forma’s future activities. Previously, the Mubes committee has carried out socialization activity throughout the FITK Master’s Program (MPBI, MPAI, MPBA, and MMPI) and get a good response from students. There are 4 representatives as chairman candidates; M Furqon (MPAI), Ibnu Aidil Putra (MMPI), Putra Topi N (MPBI), and Farisha (MPBA). Before the election, all candidates submitted a vision and mission which all aimed to improve Forma in the future and make FORMA as media to accommodate the aspirations of FITK Master’s Students. After the election was held, Ibnu Aidil Putra from the MPI Masters got the most votes with 16 votes, M Furqon was ranked second with 10 votes, third place was occupied by Putra Topi N with nine votes, and Farisha was ranked fourth with three votes. The four of them will replace the previous Forma officials, namely Usman, Harisal, Iqbal, Herdi, Baiq, and Syifa Syarifah. One of the Mubes committee member Muslikh hopes that they can devote themselves to the interests of Forma and can become the FITK Masters students’ spokesperson.